Deeeeeeeeelicious! It just looks healthy and I can imagine the textures when taking a big bite! A great light vegetarian meal. It looks so delicious! Soba is wonderful for summer time. Gorgeous Sara! That look so yummy. I haven't figured out where to find soba noodles in my local grocery store but I'll keep looking! Sarah that looks sooo tasty! Delicious and simple. Simply beautiful. This looks so fresh and healthy - nice summer dish! This looks perfectly summery and delicious. Healthy , colorful, and refreshing. Fantastic dish Sara..nice to see you posting..
Great flavors together, the salad looks so fresh and crunchy. this looks so good - light and fresh! I love that there's a high veggie to noodle ratio. What a scrumptious looking salad! I bet it taste wonderful! 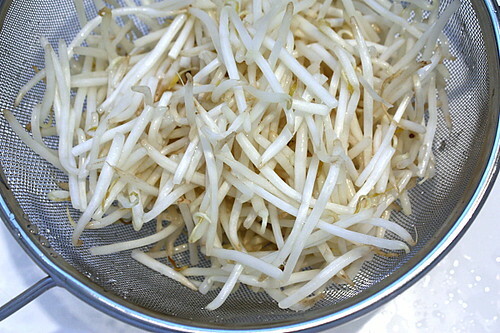 Did you cultivate the green bean sprouts yourself? I have been eating soba noodles pretty much constantly since summer started. Dishes like this are just so perfect when the weather is hot! Beautiful and healthy as always. I've never tried soba noodles - looks like I've missed something. Beautiful! I need to get some photography and set up advice from you - everything looks so crisp on your blog. What a wonderful summery dish - the dressing sounds amazing - sweet and spicy! I love soba noodles...love them. What a refreshing dish. What an excellent soba noodles dish I so adore this ! The dressing sounds really great indeed. Perfect for noodles or even marinating veggies. That looks so pretty and healthy. I think I would sear the tofu just a bit, but otherwise, YUM. The sprouts always get my vote & that is a beautiful colorful heap! That's exactly what I want to eat right now! I LOVE this! The dressing alone has me sold! Delicious! I really admire your cooking. You are so creative and adventurous! Perfect for summer and so light! Sarah that looks very tasty and a great summer dish! Sara, this looks like a healthy and delicious dish, perfect for this hot weather we are having here! I'm going to try this! Gorgeous! I love soba any which way, as does my whole family. What a perfect summer dinner. MMM sounds simple and delicious! This looks very refreshing. I love soba noodles. I think I must be a certfied nutball since I do so much baking in the summer! I love soba noodles, great meal! A perfect summer meal and the colors are lovely as well. I can almost taste the flavors. Great post! I'd love it right now (hot here) - cold! Easy, quick, healthy - pretty. I'm happy. Oh! 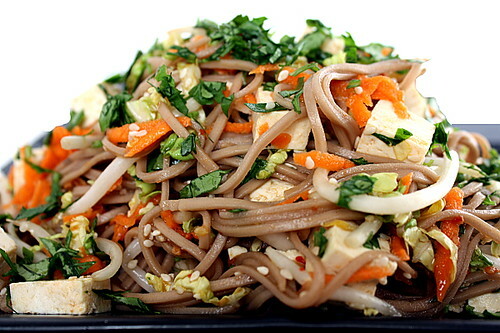 This soba looks just fantastic...lovely for the summer...yummie! Recipes that don't require much heat are perfect for July. This looks yummy and cool for a hot day. Do you have any recipes for tofu? That looks wonderful. You take the best pictures:) So perfect for summer. This looks like a great cold meal on a hot day. I might have to try it but I'll sub left over chicken for the tofu! Great recipe. I would make a big batch of this and eat the leftovers cold for lunch the next day. 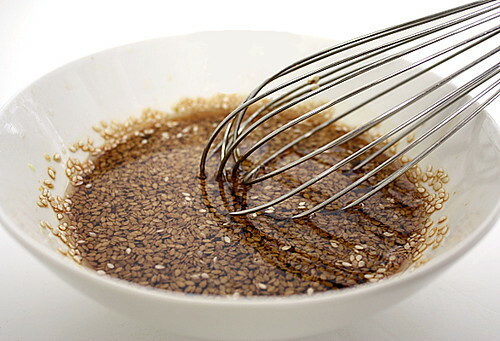 I love that you added cilantro - perfect with sesame. Oh my gosh. This looks fantastic. And I have everything I need to make this tonight. I was going to make a different chilled Asian noodle dish, but now i'm facing a dilemma. Hmmmmm. wow - that is the most gorgeous soba noodle salad i've ever seen! Hah, my kitchen actually could use a bit of heating up :) But I am always game for a quick and healthy meal! What a fantastic salad idea! I've recently fallen in love with tofu. I mean, there's not that much to love there, but the way it carries other bolder flavours is great for me! 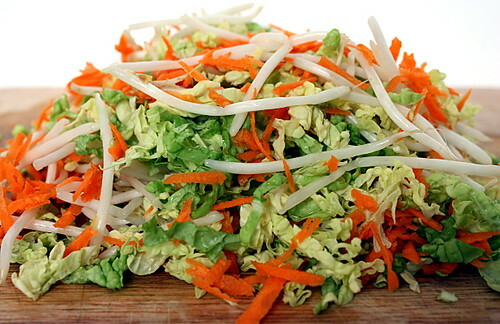 This salad must be crunchy, soft, tangy and fresh, all at the same time. Delicious! Perfect for the hot weather! Looks crisp. cool and delicious! Perfect for the weather we have been having lately! This looks fantastic - I have no idea how I missed this one in CL! Delicious! I love the flavors and this is a fabulous summer salad! I always love me a good soba dish, but for the longest time tempura seemed the best way to go. I love colorful dish! This looks really tasteful! I have been making this since you posted it! It is my favorite! thanks.